Centers for International Business Education and Research at George Washington University, Georgia Institute of Technology, Georgia State University, Temple University, Texas A&M University, University of Colorado at Denver, University of Miami, University of South Carolina, University of Texas at Austin, University of Washington, Lansing Community College, NASBITE International, National Association for Community College Entrepreneurship (NACCE), League for Innovation in the Community College, and Community Colleges for International Development (CCID). The 11th Biennial International Business Institute for Community College Faculty is a unique professional development program designed specifically for community and technical college faculty. The aim of the Institute is to provide participants with the knowledge, experience and resources they need to internationalize general business courses and/or develop specialized international business courses at the two-year college level. 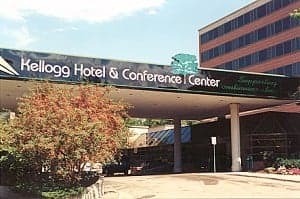 The hosting and banquet facilities are provided by Michigan State University's premier Hospitality/Business learning laboratory, the Kellogg Hotel and Conference Center.